Vidya Balan, Rani Mukherji or Priyanka Chopra: Who will essay the role of iconic folk singer Teejan Bai in her biopic? 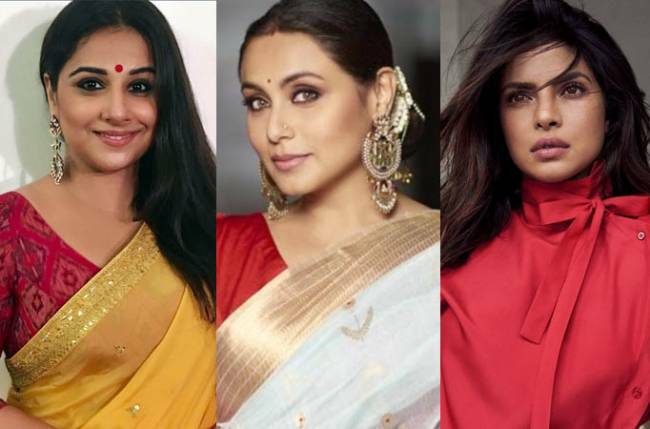 HomeBOLLYWOODENTERTAINMENT NEWSVidya Balan, Rani Mukherji or Priyanka Chopra: Who will essay the role of iconic folk singer Teejan Bai in her biopic? At a tender age of 20, he used to stand on the chair to get a good view of her performance. That was a scoop on how Nawazuddin Siddiqui was in his youth. Today, he is very excited when his wife Aaliya Siddiqui along with Manju Garhwal, under the banner of YS Entertainment, came up with the idea to make a film on the life of the veteran folk exponent Teejan Bai, that too at a time when she has bagged a plethora of international awards, including The Fukuoka Prize in 2018 and the most coveted Padma Vibhushan, this year. Hailing from Ganiyari village in Chhattisgarh, Teejan Bai was born to Chunuk Lal Pardhi and his wife Sukhwati in the year 1956. Belonging to the Pardhi Scheduled Tribe of Chhattisgarh, she has also been awarded the Padma Shri in 1988, Sangeet Natak Akademi Award in 1995, an Honorary doctorate in 2003, Padma Bhushan in 2003, MS Subbalaxmi Centenary Award in 2016, among the ones mentioned earlier. Teejan Bai, married off early as a 12-year-old child, was expelled by the community, the Pardhi Tribe. The sole reason was found to be her singing Pandavani, being a woman. Her struggles started then as she built herself a small hut and started living on her own. “She never left her singing, which eventually paid off for her. There are many facets in Teejan Bai’s life that can be written about. I felt that a film based on her life should definitely be made,” says Aaliya Siddiqui. Being a renowned exponent of Pandavani, folk art from Chhattisgarh which involves narrations and performances from the Indian epic Mahabharata, Teejan Bai’s persona charmed Aaliya Siddiqui. She felt that the writing should do justice to her biopic. Except for writing the script herself, she wishes someone apt and most-sought after for the celebrated performer. “I would like Teejan Bai’s life to be immortalized lyrically by Gulzar Sahab,” adds Aaliya Siddiqui. When Alia Siddiqui was asked who will play the character of Teejan Bai? Aliya Siddiqui says, "We want either Rani Mukherjee or Vidya Balan or Priyanka Chopra to be the one. “Teejan Bai is legendary. I have faith in Aaliya that she can make this film relevant to the general audience, and not just film festivals,” avers Nawazuddin Siddiqui, who is backing his wife Aaliya Siddiqui and Manju Garhwal. “Today she continues to enthrall audiences, the world over, with her unique folk singing and her powerful voice. She is passing on her singing to the younger generation,” adds Manju Garhwal. The film based on the life of the Folk exponent, Teejan Bai will be produced by YS Entertainment, spearheaded by Producers Aaliya Siddiqui and Manju Garhwal.